The National Pharmaceuticals Pricing Authority (NPPA), on July 10, 2014, released a new set of price notifications for 50 cardiovascular and diabetes medicines under paragraph 19 of the Drug Prices Control Order (DPCO), 2013. The notifications for the 108 formulations (two were subsequently withdrawn) of these selected medicines are in addition to the notifications for essential medicines declared under the DPCO 2013. We note that the earlier notifications for essential medicines excluded several dosage forms and strengths because they did not feature in the National List of Essential Medicines (NLEM), 2011. Thus the recent notifications were necessary to cover more of the strengths of medicines than that are listed on the NLEM. In addition, the notifications also covered medicines in the cardiovascular and diabetes therapeutic categories that are not included in the NLEM. We the undersigned civil society organizations welcome the initiative of the NPPA to cap the prices of formulations involving essential and lifesaving medicines that fall outside the NLEM as a first step towards the institution of a robust, pro-public health policy of drug price control. This is an action that truly interprets the spirit of the Drug Prices Control Order, and its underlying legislation the Essential Commodities Act, 1955. In the past, despite its attention being drawn to the profiteering in medicines not listed in the DPCO, the government had looked the other way. We are surprised at the misinformation being spread by the Pharmaceutical Industry in this regard, and its efforts to prevent relief to the consumer by filing petitions in the high courts in Mumbai and Delhi. 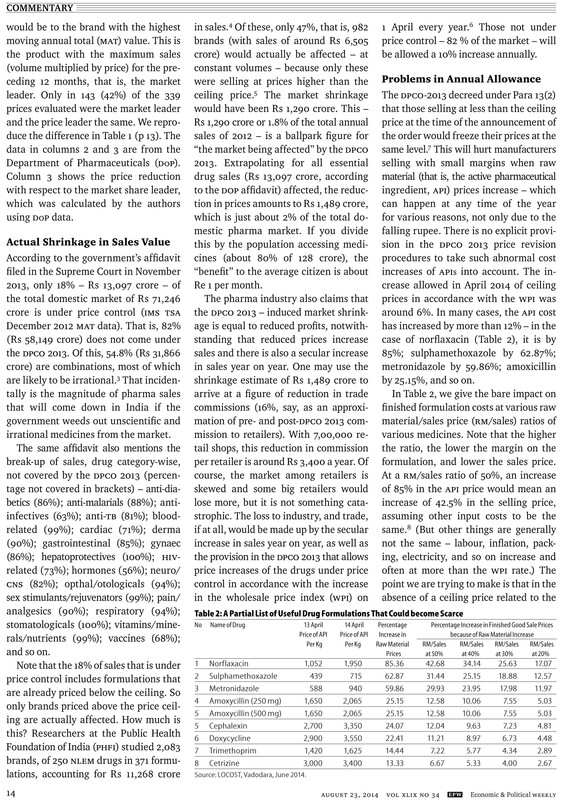 Industry has challenged the legality of fixing the prices of the 50 medicines under Paragraph 19 of the DPCO 2013 when in fact the Government has in successive drug price control orders always retained the power to intervene in prices in the public interest in the light of evidence of overpricing. 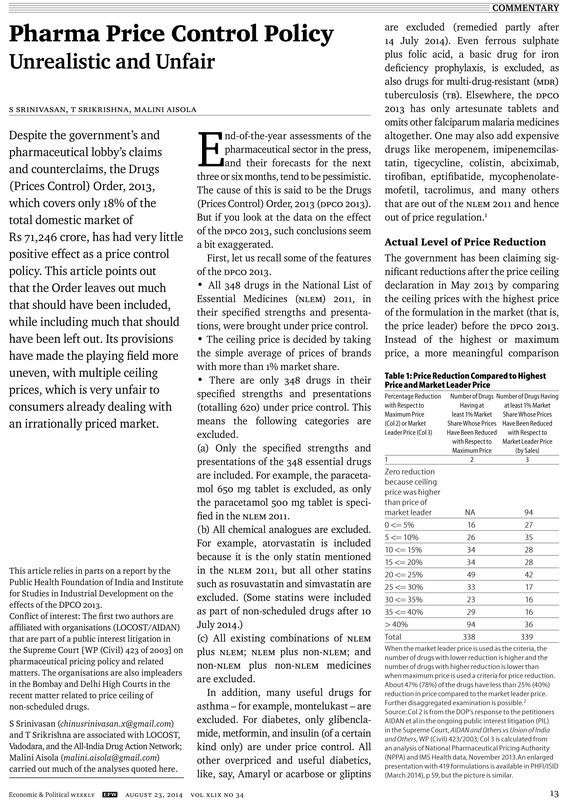 Limiting all price regulation only to a list of 348 medicines and specified dosages and strengths in the DPCO 2013 goes against the policy objective of making medicines affordable to the public. 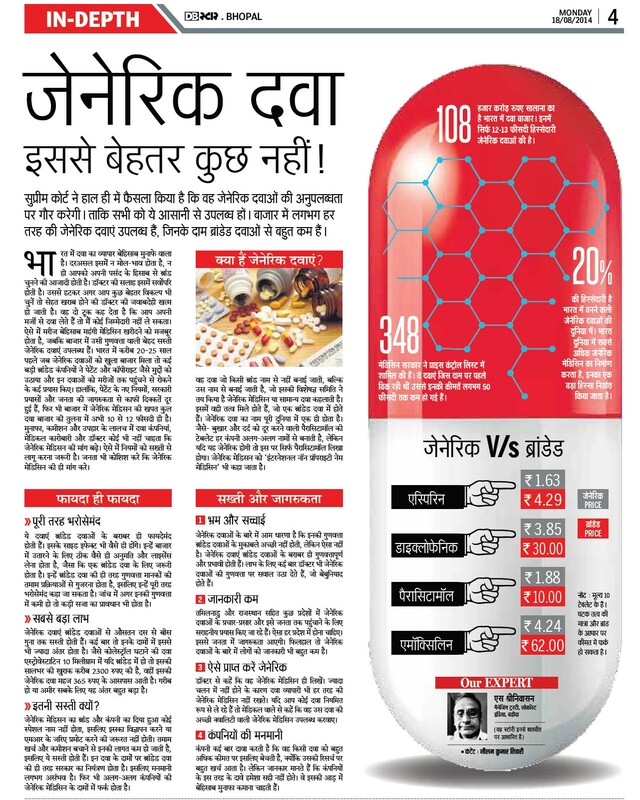 The National List of Essential Medicines, a list of 348 rational and cost-effective medicines, is not the basis for production, promotion and prescription in India. In reality the most frequently prescribed and consumed medicines are not listed in the NLEM. Industry has claimed that this will cause an annual loss of revenues of over Rs.600 crores. NPPA’s action on the market will however be marginal, and nowhere near the doomsday predictions of the industry. It will affect only those brands that were selling at very high prices. We have analysed the impact of the notifications and found that the retail market of Rs.77,526 crores (Moving Annual Total, June 2014) would experience a loss of Rs. 350 crores (AIOCD-AWACS, PharmaTrac Data, 2014). This represents a loss of approximately only 2% (Rs. 112 crore) in the anti-diabetic therapy segment and 2.5% (Rs. 238 crore) in the cardiac therapy segment. This in a way establishes the excess profits of the industry in those particular formulations by overcharging the patients. Also the market based price fixation being followed by the NPPA, a departure from the long used cost-based price control mechanism, is irrational and means that the ceiling prices are still very high. 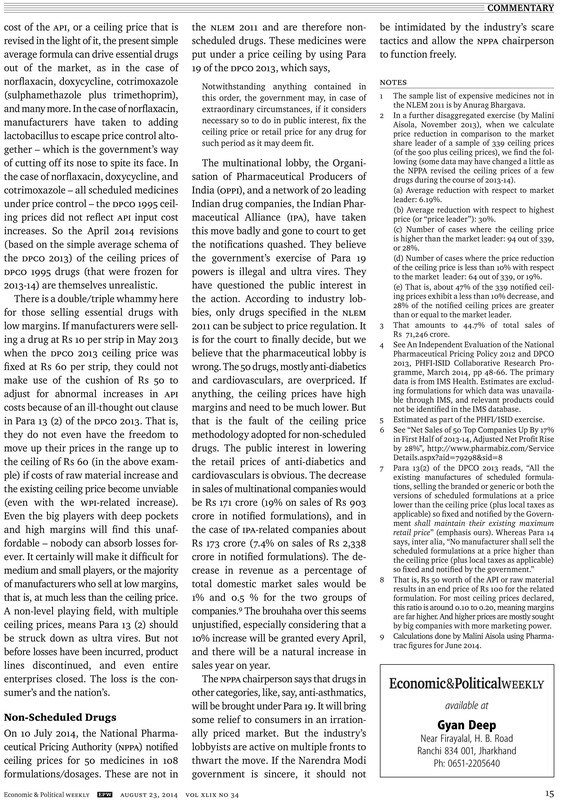 Many medicines are sold by reputed companies much below the NPPA ceiling price. The ceiling price of atorvastatin 40mg is Rs. 22.02 per tablet while Biochem Pharmaceutical is selling the same at a much lower price of Rs. 14.94 per tablet. The ceiling price of glimepiride 3mg is Rs. 10 per tablet, while Ipca Laboratories is able to sell it for Rs. 6.90 per tablet. As per our calculations only a little over one fourth of packs selling on the market will need to revise their prices downwards because they were originally priced higher than the notified price. This is evidence that there is a scope for significant reduction in NPPA ceiling prices, without affecting the reasonable profits of the industry. We also note that the notifications have not included fixed dose combinations in the cardiovascular and diabetes therapeutic categories whereas the sales of many combinations exceed those of the single molecule medicines. 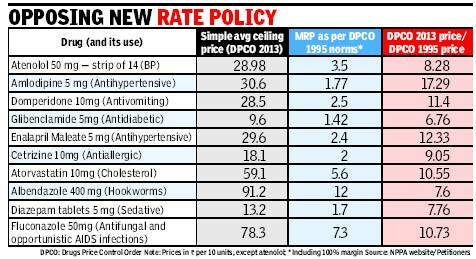 We also raise the argument that fixing of ceiling prices of all the other dosage forms of all medicines under NLEM cannot be neglected. Here again the same phenomenon of overcharging remains. NPPA should come out with similar action to cover all dosage forms and fixed dose combinations containing one or more medicines under NELM, and as well as bring other essential and life saving medicines under price control immediately. Although this notification of NPPA will give some relief to patients in the chronic disease sector in the present context, it should be expanded and rationalized. We request the Government and NPPA to strongly defend its stand and also consider the actions suggested by us to promote public health. Why your medical bill is not coming down? “Product monopolies and high prices are back in India. The MNCs have started marketing new patented drugs at exorbitant prices particularly for life threatening diseases such as cancer…….” Read more here.